The blatant human rights violations being committed against Virgin Islanders is one that exposes the continuation of the "Jim Crow Dispensation," which is systemic and widespread. We have identified numerous states andthe District of Columbia being engaged in some form of mass illegal detention of the local Black population. In case after case we have challenged and had to deal with blatant systemic criminality to repress our claims, especially from the judiciary. We have proven and documented that the American judiciary is a racist and utterly lawless fraternity, one corrupt branch of a corrupt system. Here, we are talking about the practice of not proceeding on petitions challenging the practice by the judiciary and then maintaing the "Jim Crow Dispensation" as a matter of fraternity over law. The U.S. judiciary simply refused to process the petitions of these men for their freedom and that of their fellow islanders similarly situated. It has now been three-years since the law mandated that they be processed, addressed, and resolved immediately to protect against illegal detention. The refusal to process matters that would result in any benefit to the oppressed, or especially exposes selected persons or groups to liability, is a common practice of the American judiciary. They void the "Rule of Law." WE, the UUNDERSIGNED DEMAND that the United Nations Commission on Human Rights immediately cease its failure to respond to the complaint filed by Kwasi Seitu regarding the violation of Human Rights by the United States of Black people in the Virgin Islands and in its States. We challenge the U.S. claim of "ownership" or any right to control the people and land of the Virgin Islands as acquired from Denmark by purchase in 1917. We have given the U.S. government, particularly its judiciary, every opportunity to by the Rule of Law terminate the illegal detentions of the Virgin Island "natives" and the general lawlessness of its judiciary. The U.S. government and its judiciary have refused to stop and correct its general practice of inflicting blatant racist injustices on Black people. We have positively shown to this Body that the judiciary of the United States routinely engages in the deprivation and violation of Human Rights of Black populatons, and other non-White people. We have shown that In 2015 the U.S. judiciary refused to comply with its own laws on the processing of the habeas petitions of Beaumont Gereau, Warren Ballentine, and Meral Smith challenging the fact that they had been held since 2000-01, without even the pretense of a sentence. This fact applied to over 150 of their fellow islanders, which the United States maintains by denying any means of redress. We have shown and documented our exhaustion of the judicial system, and that it refuses to comply with the "Rule of Law," with the intent of perpetuating the broad genocidal injustice. We have also shown in the course of our effort, and the U.S. has publicly stated that the "natives" of its "terroritories" are "non-citizen nationals." Thus, we further established that the Virgin Islanders were subjected to "trials" were they had no right to fairness, due process, or due protection.This admission by the U.S government verified that the decades of imprisonment as federal prisoners, prior to the U.S. terminating those sentences, was false and illegal in itself. Thus, these people have been subjected to idefinite illegal detention for the past 46-years, and the U.S. government denies them all legal means of ending it. 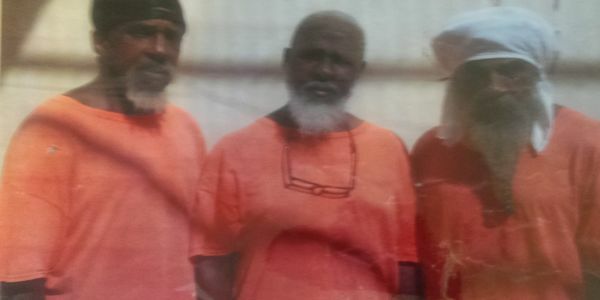 In 2000-01, the U.S. government terminated the sentences of all Virgin Island prisoners imposed by the U.S. District Court for the Virgin Islands. However, instead of releasing them, the federal government "transfered" them to the penal custody of the colonial regime.The U.S. government could not "transfer" were there was no pending sentence, none of the prisoners had any sentence imposed by the colonial courts. Thus, in 2000-01, the U.S. actually established the Golden Grove prison in St. Croix as an external "black site," two-years prior to establishing the prison at Guantanamo. Wherefore, we the undersigned citizens of this globe demand that the High Commissioner and the entire Commission on Human Rights immediately compel the U.S. to cease its practice of illegal detention in the case of the Virgin Island 3, all fellow islanders, and as is practiced domestically primarily against Black and Brown people within its various states and the District of Columbia.